It was a Thursday night in late February in Little Falls, and the circus had come to town. 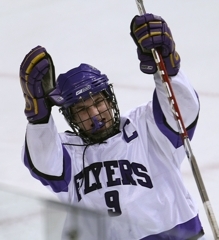 What was originally scheduled as a high school hockey game -- the hometown Flyers against St. Cloud Apollo on Feb. 19, 2009 – suddenly had become an event unlike anything the central Minnesota town with a population of 8,000 had ever seen. Fans with no allegiance to either Little Falls or Apollo showed up in droves, and the atmosphere inside a packed Exchange Arena was more fitting for trapeze artists, clown cars and dancing elephants than it was for a regular season game. “It was a one-of-a-kind thing, something that would probably never happen again to you,” Little Falls coach Tony Couture said. Flyers senior Ben Hanowski was on the verge of breaking the state’s most coveted record. 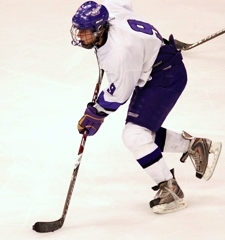 He needed one point to tie and two to overtake Johnny Pohl of Red Wing for the title of Minnesota Scoring King. 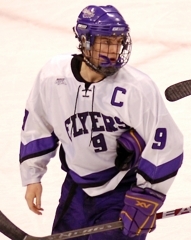 Pohl, who starred at Red Wing and the University of Minnesota and later played in the NHL, owned the career mark of 378 points. Hanowski was one behind at 377. Hanowski needing to score two points in a game was like a pro golfer addressing a two-inch putt. There was no doubt he was going to break the record, and everyone wanted to say they were there to see it happen. “Our building only seats a couple thousand,” Couture said. “I remember our JV team was excited because it was absolutely packed for their game. More than just big and strong, the 6-foot-2, 198-pound Hanowski possessed a keen rink sense. His playmaking was just as good as his scoring. And his scoring ability was off the charts. All season, fans in Little Falls had been mesmerized by Hanowski’s chase for the record, counting down every goal and assist as if they were ticking away the seconds at Times Square on New Year’s Eve. Stunningly, Hanowski did not score in the first period against Apollo. No goals. No assists. “I thought, ‘Holy smokes I better get it done here so all these people don’t go home disappointed,’ ” said Hanowski, who is entering his third season playing for St. Cloud State. Sure enough, with the Flyers two-men short early in the second period, Hanowski stole the puck at the Apollo blue line and raced in alone on Eagles goaltender Kevin McGuire. Hanowski’s shot hit the goaltender, but the puck still managed to dribble over the goal line. The record had been tied. Five minutes later, with Little Falls on a power play, Hanowski grabbed a lose puck and launched a rocket into the upper right corner of the net. The record was now his. “When he scored and broke the record, he jumped on the bench and everyone was hugging him,” Couture said. “We presented a plaque to him. He was on the bench after this whole thing, and there was a camera guy and a reporter there, too. They were on our bench interviewing him right during the game. 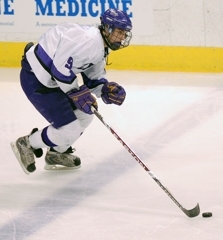 Hanowski finished his career with 405 points and four state tournament appearances. After that loss to eventual Class 1A champion Breck in the state semifinals, Little Falls rallied from a three-goal deficit to beat St. Cloud Cathedral 4-3 for third place. The winning goal came with 22 seconds remaining. It was scored by Hanowski. Who else? “I tell the high school kids, when I go back home and skate, there is nothing like the state tournament,” Hanowski said. “You are with all your buddies that you played with when you were 5 and 6. I was really fortunate to go four times, and I didn’t take any of them for granted.